Everyone has their own idea of what the term “soul” means. It can be used to denote an attitude, or describe the ghost like identity supposedly inside everyone of us. Using today’s English language, we can search the soul, sell our soul, have soul, or be the life and soul of the party. You can even listen to soul music, too. In this brief article, though, we will take this opportunity of setting forth a few fundamental principles regarding the soul as shown by the Scriptures. We cannot hope to cover every aspect of this large and complex issue, but even a basic understanding will help us to appreciate some important ways that God deals with His creation. Read the verse again: the man was formed, the breath was given, and he then became a soul. The body of dust + the breath of life = a living soul. The Bible is crystal clear about this matter. Man does not HAVE a soul; rather, man IS a soul! Now, some might suggest that this is just playing with words here, but the verse emphatically states this about the soul. 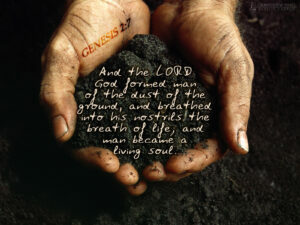 Here, we will briefly look at Genesis 2:7, concentrating on some of the features of dust, breath and the soul. Man’s / Adam’s body was formed from dust. Now, there is some debate over whether the Hebrew word in this verse should be rendered Adam or Man. It would seem that “Adam” is derived from the Heb word adamah meaning “ground” or “red soil”, but the fact remains: this first man was made out of dust. If you find it difficult to believe that man’s body is made from dust, it just may surprise you to learn that man and soil are comprised of the same basic elements! They might be present in different proportions, have different shapes and textures, but the same elements are generally present in both soil and the human body. Compare the elements in the table below. The statement that man’s body is dust is supported elsewhere, too. In cursing the ground, God said of Adam, “out of it wast thou taken: for dust thou art” (Genesis 3:19). Abraham acknowledged that he was only “dust and ashes” (Genesis 18:27). The Lord in His mercy, “pitieth them that fear Him. For He knoweth our frame; He remembereth that we are dust” (Psalm 103:13,14). But God did not form a body into which would soon be placed the “real person”. Note that the Lord formed a MAN from the dust of the earth. Adam was a man before he could feel, breathe or think. In other words, He had brains, but could not think or reason; eyes, but could not see; ears, but could not hear; a nose, but could not smell; hands, but could not pick up anything; feet, but could not walk. The man as created from the soil was not lacking any organs – but he still needed something to enable all these aspects to function. This something was the breath of life. (2) ruach, which has the basic idea of “air in motion”. The word ruach means an invisible force such as breath, wind, etc. and is sometimes used to indicate angels & other unseen spirits, both good & bad. The following are some examples of how the two words, when meaning “breath”, are interchangeable. In Hebrew poetry, we often find ideas and concepts which rhyme together, rather than syllables, as in English poetry; so, the same thought is being expressed in two different ways. “All the while my breath (neshamah) is in me, and the spirit (ruach) of God is in my nostrils” (Job 27:3). “But there is a spirit (ruach) in man: and the inspiration (neshamah) of the Almighty giveth them understanding” (Job 32:8). “The spirit (ruach) of God hath made me, and the breath (neshamah) of the Almighty hath given me life” (Job 33:4). When the Lord gave life to the synagogue ruler’s daughter we are told that, “her spirit (pneuma) came again, and she arose straightway” (Luke 8:55). Two prophets spoken of in Revelation are killed and left where they died for 3 1/2 days … “And after three days and an half the Spirit (pneuma) of life from God entered into them, and they stood upon their feet” (Revelation 11:11). “The body without the spirit (pneuma) is dead” (James 2:26). So, the body of dust needs the spirit or breath to live. It seems, then, as if it was a form of what we call artificial respiration that God gave Adam – there was air all around Adam’s body of dust, but it took another life force to invoke him with it. This life force came from God, as is apparent from the O.T. and N.T. verses above, and from Ecclesiastes 12:7 which states that, at death, “the spirit shall return to God Who gave it”. No wonder that all attempts to create life artificially in the laboratory have failed. This privilege is reserved for the Creator, and Him only. So, Adam’s lifeless physical structure was combined with the breath of life breathed into his nostrils. As a result, he became something that he wasn’t before: a living soul. To further understand this idea, let’s refer to some illustrations from everyday life. Think of what happens when an artist mixes blue paint with yellow paint. The result is a new colour altogether: green. The two have been combined to form something totally new. This is similar to when two parts hydrogen combine with one part oxygen. A new substance is formed: water. And so it is with the soul. Two different components (dust and breath) combine to form a new entity (the soul). We have all heard the term “body & soul”. It is used in our day to day language to denote the different parts of one’s total being. After seeing what the Bible says, this term does not make much sense when we use it in that way, does it? It’s sort of like saying “Queensland & Australia” are two different places or objects, when, actually, one is a portion of the other. Perhaps we should start saying “body and breath” instead to express this thought in our speech. There is one particular way that the term “soul” is not used so much in the English language these days. After the sinking of the Titanic in 1912, it was often reported that over 1500 SOULS had been lost. What the news reports were really saying was that over 1500 human beings had lost their lives in the tragedy; 1500 people died. Putting the monumental scale of this disaster aside, this usage of the word “soul” is as close to the Biblical usage as we can get. A soul is a complete human being. As we have seen, the term “soul” in the Bible denotes the entire person, an indivisible entity. So it is natural to learn that the soul can do all sorts of very physical things. The soul can eat (Deuteronomy 12:20), and the soul can touch things (Leviticus 5:2); Midianite souls were captured along with livestock and divided among the Israelites (Numbers 31:27,28); and so on. All of the souls mentioned in these examples are normal human beings. Here, the thought “my soul” rhymes with the thought “all that is within me”. A soul is yet again shown to be a total person, rather than just a portion of one. The traditional view of a soul, however, is that it is an invisible non-physical force within us which contains our personality and reasoning ability, or our “real self”. This “real self” supposedly does not ever die and is held inside our body and released at the point of physical death. Most religions would suggest that it then goes on to either some form of heaven or hell (or purgatory, to wait a bit longer). It’s interesting that the one common factor with almost every religion and philosophy is a belief that all human beings possess the inherent ability to survive death. This belief is based on the idea that we have an indestructible soul and that the “real self” cannot be destroyed. In other words, many believe that there is a part of ourselves which survives and lives on after the body finally succumbs to death. This idea is reinforced everywhere in society from fictional characters in the movies to spiritual gurus; from the local psychic to Casper the friendly ghost. Think of all the stories you’ve read or heard about long lost relatives speaking from the dead. Literary classics are full of such scenes, e.g. “MacBeth”, “Wuthering Heights” and “A Christmas Carol” to name but a few. This thinking is everywhere, but wherever it came from, this thinking certainly did not come from the Bible. The message which comes across is that, regardless of your religious viewpoint, every human being carries on in some way after the body has died. That no matter what decisions we have made in our earthly life, our “real self” goes on to survive in other pastures. The question of what constitutes death has been debated by doctors, scientists and plenty of others for centuries. The Bible does not supply the answer for every biological question, but from the verses above, we can confidently say one thing: death is a return. Likewise, the breath of life which was given to Adam (Genesis 2:7), and is also given to us, returns to God who gave it in the first place. Here, the breath becomes separated from the body, and death takes place. Think about what happens when a person is dying and you can see that the Bible is right about this. When administering first aid to an unconscious person, the first thing one must attend to is the person’s airway. Regardless of how weak or strong their pulse might be, if they cannot breathe, they cannot live. Putting it simply: when a person dies, the physical body returns to the ground, their breath returns to God, and thus the soul then ceases to exist. For further study on this particular aspect, you might like to consider Genesis 6:3; Job 7:21; 10:9; 17:16; 20:11; 21:25,26; Psalm 7:5; 30:9; Ecclesiastes 3:19- 21; Isaiah 26:19; Daniel 12:2. If there’s one point that really needs to be made, however, it is this: that our future existence relies totally, thoroughly and utterly on THE LORD, and not at all on ourselves. We will not live after our death if He does not resurrect us. A common misconception is that when a Christian dies, he or she goes to be with the Lord forever. But the Bible does not say that Christians, or anybody else, go instantly to heaven at the point of death. Rather, they die and remain dead until they are resurrected by the power of God. In the terms of Scripture, they are said to be “asleep”, as if waiting to be woken up. “So David slept with his fathers, and was buried in the city of David.” “For David is not yet ascended into the heavens.” (1 Kings 2:10; Acts 2:34). “When [Stephen] had said this, he fell asleep. And Saul was consenting unto his death” (Acts 7:60; 8:1). Think about what John 11 tells us about the Lord’s friend, Lazarus. (a) There is no mention of Lazarus’ personality or immortal ghostly soul floating around somewhere. (d) Martha did not think he had gone to heaven, either. “Jesus said unto her, `Thy brother shall rise again’. Martha said unto Him, `I know that he shall rise again in the resurrection at the last day. '” Note the need for resurrection; this fact cannot be emphasised too many times. It’s not popular. It may not even be very comforting for some people, but the Bible demonstrates clearly that LIFE AFTER DEATH IS CONDITIONAL, not automatic. We are not told these things so that we will be disappointed or feel let down; rather, they are there to help us grasp the wonder and glory of what the Lord has in store for us. You might also like to read What Happened to Enoch, Elijah and Jonah? A more detailed consideration of these and other related topics may be found on this site by clicking on Life, Death and Resurrection. Thanks for your article on what the soul is. Coming from a mid-Acts background I often wondered (among many other things) if what was taught to me about the immortality of the soul lined up with the scriptures — I just accepted it as truth but not anymore ! Though it does puzzle me that with my encounters with Jehovah’s witnesses and Seventh day adventists over the years that they teach a similar thing on the soul and death in the grave (hell) etc, I use to venomously debate their beliefs on those subjects but in view of my new understanding on those things — I am sort of wondering not to discuss those things with them anymore and concentrate on sharing salvation by grace through faith in our Lord Jesus Christ (Eph 2:8-9) only. Hi Rod. Thanks for sharing your thoughts. Since you’ve asked for some thoughts, my fundamental starting points in discussing the things of God with anyone are … The Bible is God’s inspired word; there is one true God; everything in existence is God’s creation, Jesus Christ is and was God and man; man is not inherently immortal and must be granted immortality; and the only way to be reconciled to God is through faith (not works) in Jesus Christ, as per Ephesians 2:8,9, which you have suggested. In essence, I agree with the approach you are considering, in concentrating your message on “salvation by grace”. There’s not one of us who has a monopoly on the truth – and hopefully we will learn more as we journey through life – but faith in Christ really is one of the fundamentals of the Christian faith and should be prioritised in our discussions with those who may not believe it. Thanks again for your post – David T.